A pearl, something considered beautiful, strong and worthy of jewelry, is created when a natural irritant slips between the mantle and shell of an oyster (the mantle is the organ that makes the oyster’s shell). The oyster’s natural reaction is to protect itself, so the mantle gets to work, covering the irritant (usually sand) with layers of the same nacre substance that is used to create the shell. This eventually forms a pearl. Diamonds, the most valued gem in the world, were created when carbon was crystallized under extreme temperature and pressure conditions. Most natural gems are made in similar “painful” fashion. Those things we find beautiful in life are often created from what can be perceived as irritation and pain. Over time, and with patience, we see something beautiful formed from difficulty and discomfort. Like a pearl, there is beauty, strength and a great deal of growth to be found in those things that cause aggravation in our lives. You might have to crack open the shell, or mine deeply, to find it. 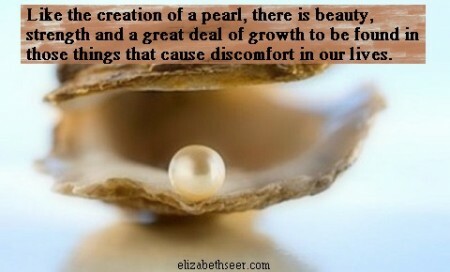 beauty from discomfort, growing pains, pain, painful change, patience. Bookmark.